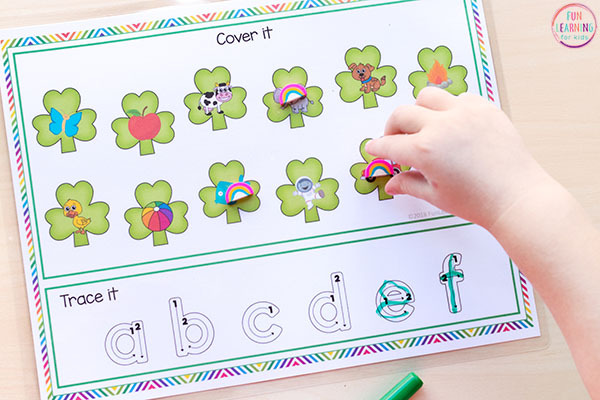 This shamrock roll and cover letter sounds activity will make learning letters a fun, hands-on experience this St. Patrick’s Day! 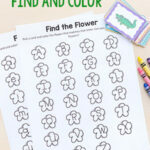 It is perfect for literacy centers and kids in preschool and kindergarten. 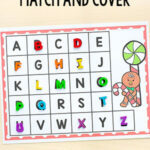 So if you are looking for an engaging St. Patrick’s Day alphabet game for the kids to play, keep reading! 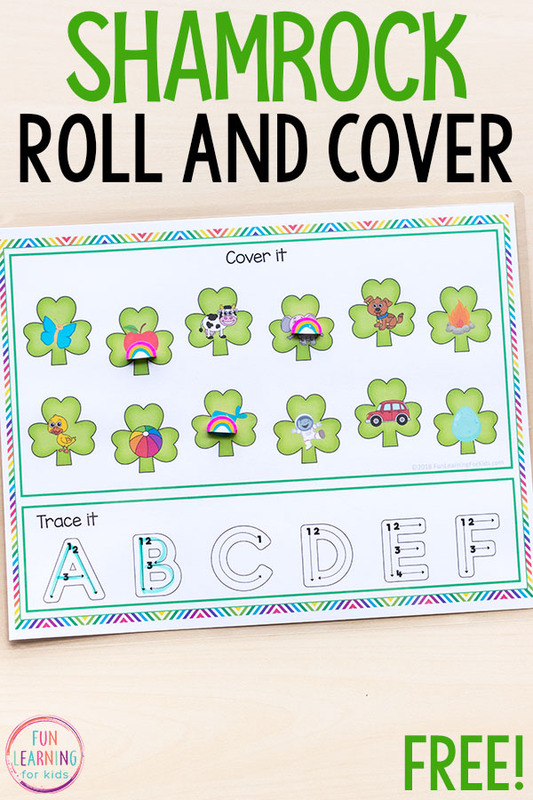 Make sure you also check out this St. Patrick’s Day roll and cover number activity! 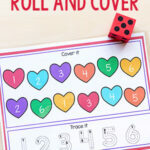 We are really loving the roll, cover and write mats! The kids are enjoying them so much and so many of you have downloaded them and sent emails telling me how much your kids have enjoyed them, so I am going to keep them coming. 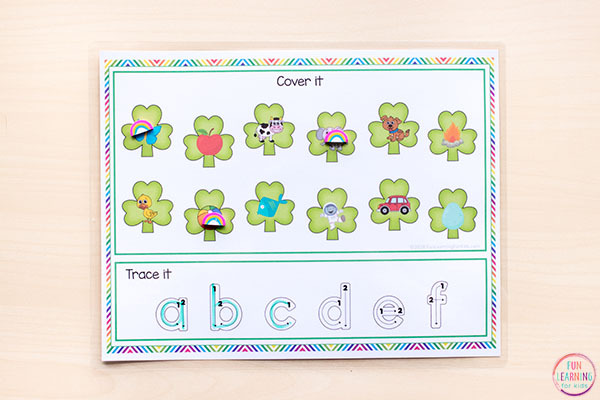 The shamrock roll and cover mats include all of the letters in the alphabet. 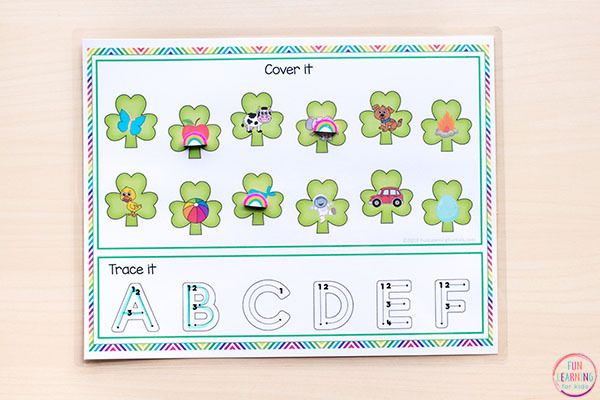 There are uppercase tracing letters, lowercase tracing letters and handwriting lines for children who have moved beyond tracing and just need to practice writing the letters on their own. 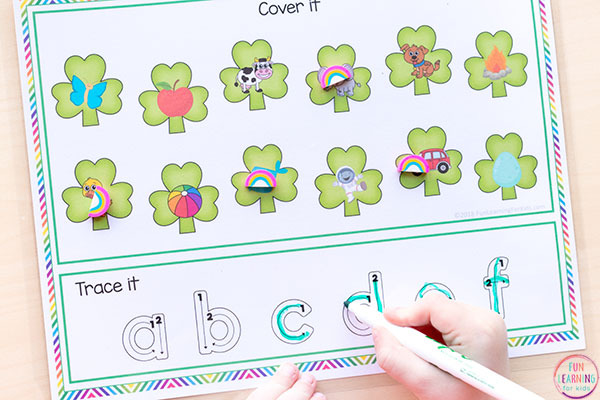 Not only is this a fun way to develop these very important literacy skills, but is also hands-on and engaging for young kids who often lose interest quickly. 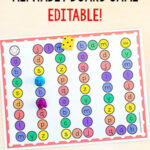 So ditch the flashcards and try an alphabet game! 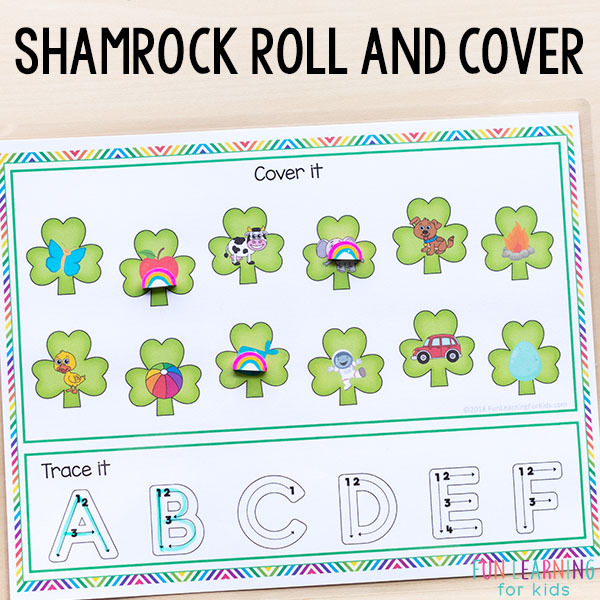 I created these shamrock roll and cover mats in a way that requires very few supplies and limits the amount of prep you need to do ahead of time. Children will roll the alphabet dice. 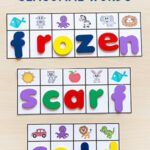 Then they will cover the corresponding beginning sound picture on the mat with some type of manipulative. In this case, we used rainbow mini erasers. Gold coins would also be perfect too! Then they will write the letter or trace it, depending on which mats you are using. The kids think these roll and cover mats are awesome! 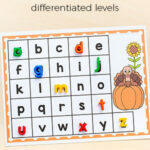 They actually enjoy learning letter sounds and practicing handwriting. Seriously, it shocked me how much they like these. Give it a try and see if your kids feel the same way. I hope they love it just as much!